Patents wars are from the past. Nowadays, big companies don’t want to spend money and time in courts, so they try something more effective: signing cross-license partnerships. In an innovative economy, in which developing products and software is a must, this is the key to success: to collaborate, not to fight anymore. Cisco is an American international company which makes network equipment, being a top company in its domain. 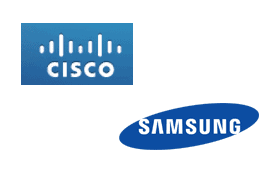 Samsung just announced a cross- licensed deal being signed with Cisco for a ten year period. It’s an interesting period, as this weeks there were so important deals closed: Samsung-Google, Samsung- Hyundai, Samsung- Cisco, Twitter and IBM last year. Dan Lang, Cisco’s VP of Intellectual Property said that this an opportunity for the both companies. With a cross-license deal, both companies can focus on advancing innovation in the future. The deal gives access to one’s another patent portfolios.For the next ten years the patents will be also shared. “We look forward to working with Cisco. We expect this agreement to result in mutual growth and, ultimately, for the benefit of both companies’ customers across the world.” declared Samsung’s Head of Intellectual Property. What will be the next company with which Samsung will sign? It seems that 2014 will be a blue and white year.